In defense of Des Ford, I seek to provide Spectrum readers a wider context of happenings in the South Pacific Division from the 1960s until Glacier View in 1980. Most have a fair understanding of what occurred subsequently. I’m an Australian who has lived in the United States for almost 30 years and am now a U.S. citizen. I have read Spectrum since the 1980s and subscribed for many years. Now I click on Spectrum weekly, essentially to read Barry Casey’s essays! I’m also an Adelaide boy like Bill Johnsson. What follows presumes you have read Bill’s essay published by Spectrum on March 13, 2019, Des Ford: The Perils of Being Right. I appreciate Bill’s thoughts on Des Ford’s life and career. He writes so many accurate and telling statements to amplify the extraordinary ministry of Desmond Ford. However, Bill drops off the planet with his replaying of the interchange between Margit Heppenstall and Des. What was Bill thinking? In the comments following the article, Gill Ford says it was “a joke between friends,” Milton Hook calls it “banter,” Norman Young comments it was “obviously facetious,” and Angus McPhee reminds us of an expression often used by Des: “50% of what I say is wrong, but I don’t know which 50%.” My email has worked over-time ever since! Perhaps a few comments will help in explaining the socio-organizational aspects of the South Pacific Division (SPD), known as the Australasian Division until 1985. The bulk of SPD’s current membership is to be found in the south Pacific island territories, with the homelands of Australia and New Zealand having around 100,000 church members (about the same size as the Columbia Union Conference). There are nine conferences in Australia and two in New Zealand. Historically, annual camp meeting in each of these conferences was a big event. Church members typically enjoyed listening to the key evangelists of the day hold a series of meetings, or at least speak on the two Sabbaths which bookended a camp meeting session. Each evangelist developed a certain following and was treated with a degree of deference. After the early 1960s, when Des Ford had returned from study leave and was now chair of Theology at Avondale College, he rapidly became a preferred camp meeting speaker requested by most conferences. With his emphasis on the Gospel and the personal assurance of salvation by faith, the evangelists were quickly relegated to the side line. Ford had extracted a new message of hope and joy from within traditional Adventism. The aging evangelists were no match for this youthful, engaging preacher. “Dead Men Do Tell Tales” had run its course! Overtime, jealousies arose and, combined with the perfectionist controversy, the Adventist church in Australia and New Zealand embarked on what has been dubbed “The Righteousness by Faith” era. For many of us in the homelands, and for denominational workers in the south Pacific island territories, the 1960s and 1970s were exciting days to be Adventist. Yet, there was conflict. The lines were drawn, and it was difficult to remain neutral. You were either in the legalist camp (traditional Adventism, active or stultified) or part of the grace team (believing in salvation by faith, and not works). I was a boarding school administrator at the time and, on one afternoon, I stopped a student with suitcase in hand from getting into a taxi to go home. Why? Because he could not see himself achieving perfection of character as promoted by one of his teachers. One conference president reported to a union committee after attending an inter-denominational association for all clergy in Melbourne. One of his peers from another denomination said, “Ken, I envy you with your church controversy. At least you have members who are reading Scripture and asking questions.” Unfortunately, if you were an Adventist in some parts of Australia or New Zealand, and you asked too many questions, you could be censored. It all seems so long ago now, but it was that intense. We even nick-named one rigid administrator as the Ayatollah. The challenge during these years was understanding the biblical meaning of the Gospel, and all its implications for living Adventism until Jesus came. To be sure, there were doctrinal issues and matters of prophecy called into question, but the greatest need of church members was a closer walk with Jesus. Where was the joy, the dynamism, in being Adventist and the promise of finding the “abundant life”? The answer was to be found at Avondale College, which had a plethora of talented lecturers/professors in numerous disciplines, but there was none better than Desmond Ford to expound upon salvation by faith. Here was new synergy and it was eagerly embraced, but not by all. The discord between the Concerned Brethren (CBs) promoting traditional Adventism and the grace team continued. A change of SPD administration occurred in 1975 and, suddenly, the CBs gained a foothold of power and influence over senior leadership. It became intense, and in 1977, Des Ford and family were transferred to Pacific Union College for a brief interval, or that is how the story went. What followed the PUC Forum meeting to Glacier View is commonly known by Adventists. What is less known is that Aussies and Kiwis made Des Ford our hero. Compared to the size and grandeur of the North American Division, SPD lacked a plethora of preachers like Des Ford. He was one of a kind. He was personable, he smiled and readily spoke to all who approached him. He emphasized the need to care for the whole person and healthful living was modeled by him as he walked or jogged visibly on camp grounds, or wherever he found himself. Often, if you wanted to talk with him, you walked and tried to keep up. He was gracious and he always enjoyed a good laugh. Once in his Life and Teachings class, there was discussion on temptation when an overly zealous theo student came back with a slightly misguided quote from Mathew 5:30 and he called out, “As Scripture says, ‘If it offends you, cut it off!’” In an instant, the 60-some students in the lecture theater and their professor dissolved into laughter. I have never seen Des Ford laugh so much and so heartily. Honestly, Bill Johnsson, what were you thinking in not recognizing the banter in the exchange with Margit Heppenstall? In the mid-1980s, I was at the University of Maryland pursuing my PhD. I worked part-time at Columbia Union College. Here I came across the final throes of perfectionism as promulgated by Australian Colin Standish. I became friends with Richard Fredericks who had made the journey from perfectionism under Colin Standish’s tutelage to an understanding of righteousness by faith under Des Ford. Like Des, Richard had a presence which attracted members and non-members to his preaching. Eventually, Richard decided to depart the ranks of Adventism and established a non-denominational church with a sustainable congregation even to this day. I have written enough! It is good to reflect on the fact that we all are God’s children. (May Bill Johnsson forgive me if I have been too harsh.) Des survived the ire of the brethren better than anyone I know. His stock standard answer for those who suggested retribution was clear and final: there’s no good to come of it! He wasn’t arrogant in any shape or form. 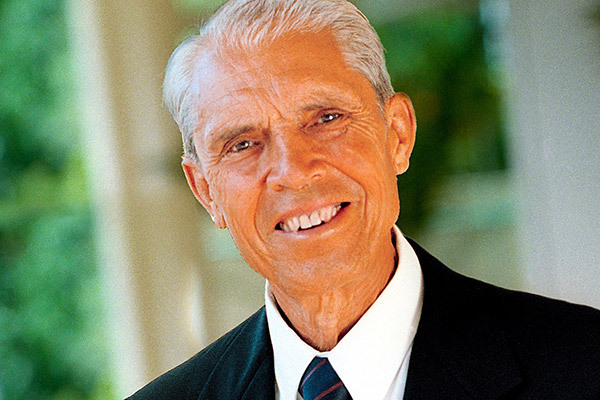 He was convicted that the time had come to speak up after seasoned leaders and scholars had talked to him since the 1950s about the need to correct Adventist doctrine. He was nudged by many to pressure Adventism to address its skeletons. It was a pity his case was caught up in a sordid witch hunt pressuring for his defrocking. We can only hope that the precepts of professional human resource management and good organizational behavioral practice are inculcated more urgently into the operation of global Adventism. How different this saga might have been! Desmond Ford taught us that! If he has no other legacy, that is enough. Image courtesy of the Desmond Ford Facebook page.